This historical minireview describes basic lines of progress in our understanding of the functional pattern of photosynthetic water oxidation and the structure of the Photosystem II core complex. After a short introduction into the state of the art about 35 years ago, results are reviewed that led to identification of the essential cofactors of this process and the kinetics of their reactions. Special emphasis is paid on the flash induced oxygen measurements performed by Pierre Joliot (in Paris, France) and Bessel Kok (Baltimore, MD) and their coworkers that led to the scheme, known as the Kok-cycle. These findings not only unraveled the reaction pattern of oxidation steps leading from water to molecular oxygen but also provided the essential fingerprint as prerequisite for studying individual redox reactions. Starting with the S. Singer and G. Nicolson model of membrane organization, attempts were made to gain information on the structure of the Photsystem II complex that eventually led to the current stage of knowledge based on the recently published X-ray crystal structure of 3.8 Å resolution in Berlin (Germany). With respect to the mechanism of water oxidation, the impact of Gerald T. Babcock’s hydrogen abstractor model and all the considerations of electron/proton transfer coupling are outlined. According to my own model cosiderations, the protein matrix is not only a ‘cofactor holder’ but actively participates by fine tuning via hydrogen bond networks, playing most likely an essential role in water substrate coordination and in oxygen-oxygen bond formation as the key step of the overall process. 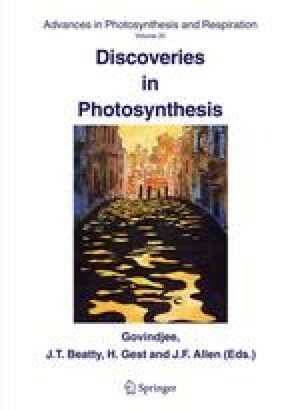 This historical minireview is dedicated to Jerry Babcock, a pioneer in photosynthesis research. Three photographs of Jerry are shown in Figure 1 (see Yocum et al., 2001, for Jerry’s obituary).